Don't get the wrong idea from its name: Castle Crags State Park doesn't have a real castle to visit. Instead, it's home to a natural rock formation that outshines any manmade castle. At this northern California park, you'll find jagged spires of stone so beautiful that some people say they're California's only five-star-rated bunch of rocks. As if that weren't enough, Castle Crags is one of the best places to see another Northern California favorite: Mount Shasta. And here's the weird thing: Thousands of vehicles drive right past Castle Crags every day and less than one percent of them stop. If you're driving past it on I-5, instead of sticking with the mindless many, be one of the few who get off the road and take a few minutes to enjoy its scenic beauty. The native Okwanuchu Shasta people thought the Castle Crags area was sacred: a place where the spirits went to seek solace. Today's visitors find solace there, and they love the scenic beauty of the place. Unfortunately, Interstate Highway 5 and a railroad cut the park in half, and you have to get away from the highway to get that peace and quiet you may be craving. In fact, noise from the cars and trains are visitors' most frequent complaints. Drive to the Vista Point: You'll have to pay an entrance fee to get there, but it's well worth the cost. The road up is passable but narrow, with steep drop-offs and no shoulders. In fact, it's so narrow and curving that RVs and trailers are not allowed on it. Once you get to the parking lot, take the short, easy walk to the Vista Point where you will get a panoramic view of the crags. You will also see Mount Shasta, the 14,179-foot-tall snow-capped volcano roughly 30 miles north. Go Hiking: The only way to get into the heart of the crags' massive granite formations is by foot. The park has about 30 miles of trails and only 4 miles of road. The Castle Dome Trail takes you above the tree line and is about 6 miles total, but some people say it's the hardest 6 miles you'll ever hike. You can get detailed information about the hikes at Castle Crags at AllTrails.com or get advice from a park ranger after you arrive. Go Swimming: When the weather is warm, you can swim in the Sacramento River and in the creek, but there are no lifeguards. Go Fishing: The Sacramento River runs through the park parallel to the highway and locals say its waters are tops for wild trout. You can cast for them in the river and in nearby Castle Creek (and hopefully catch one) but you need a license to do it, and there's a zero limit for taking them home: It's catch and release only. Go Rock Climbing: If you are a rock climber who has the skill, equipment, and training, you'll find about a half dozen rock-climbing routes, including the well-rated Cosmic Wall. You can find details about the routes at Mountain Project and also at The Crag. Explore the Area: Drive 20 minutes north of Castle Crags to see Mount Shasta. It will take you about 40 minutes to get to Lake Shasta where you can explore the lake, tour the dam and surroundings. Castle Crags is open for camping year round. The campground can accommodate trailers up to 21 feet long and motorhomes up to 27 feet. Each of the campsites is equipped with a picnic table, food locker, and a fire ring. You'll find flush toilets, showers, and drinking water nearby. Campground quiet hours are from 8 p.m. to 10 a.m. Unfortunately, the traffic on the nearby highway and railroad don't obey those rules. If you're a light sleeper, bring earplugs to block out the traffic and railroad noise. Campsites 26, 28, 31, 35, 36 are among the noisiest. For a more peaceful stay, use the campground map to pick a site on the Upper Loop as far from the highway as you can get. Tent sites are available along the river and in the woods on the west side of I-5. 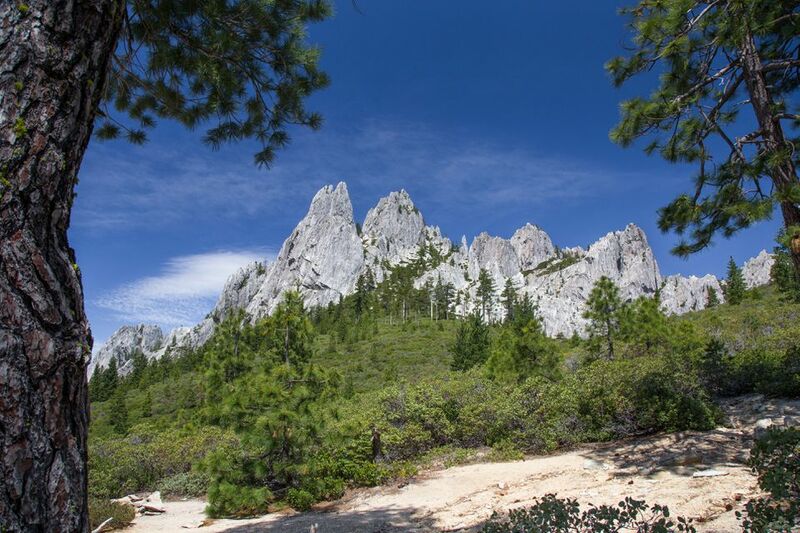 Castle Crags is one of the least busy parks in all of California and is sometimes the only state park with open campsites on a summer weekend, but if you're making a long trip to get there, camping reservations are a good idea. Making reservations at the California state parks can be a frustrating process, but you can avoid all the mistakes and get it done fast when you use our guide to making reservations at California state parks. Bears may come into the campground at any time of the day or night. Store your food in the bear lockers. For other safety tips, check out our guide on how to stay bear safe in a California campground. The weather can be hotter than you might expect for a place so far north. In mid-summer, average high temperatures soar above 90 degrees F, while the temperatures dip to the low 20s in the winter. Pets are allowed, but you have to keep them on a leash, and they can't go on any hiking trails. They must also be confined to a vehicle or tent at night. If you are camping or staying for more than a few minutes, be prepared for insects. Mosquitos are common, and you'll be glad you brought a couple of disposable yellowjacket traps when you see other campers shooing them away. Water spigots may be turned off during the winter. Call to ask and bring your own if they are. The park's base elevation is about 2,000 feet. That's probably not enough to provoke altitude sickness, but you may wonder why you feel a little short of breath. For more information about the park, visit the Castle Crags State Park website. Castle Crags is just off I-5, 6 miles south of Dunsmuir and 48 miles north of Redding at exit 724. The entrance station address is 20022 Castle Creek Road, Castella, CA 96017.